Newly Renovated with Great Location on the Gulfside. No Hidden Fees!! Need a family vacation that takes you away from the crowded summer beaches? 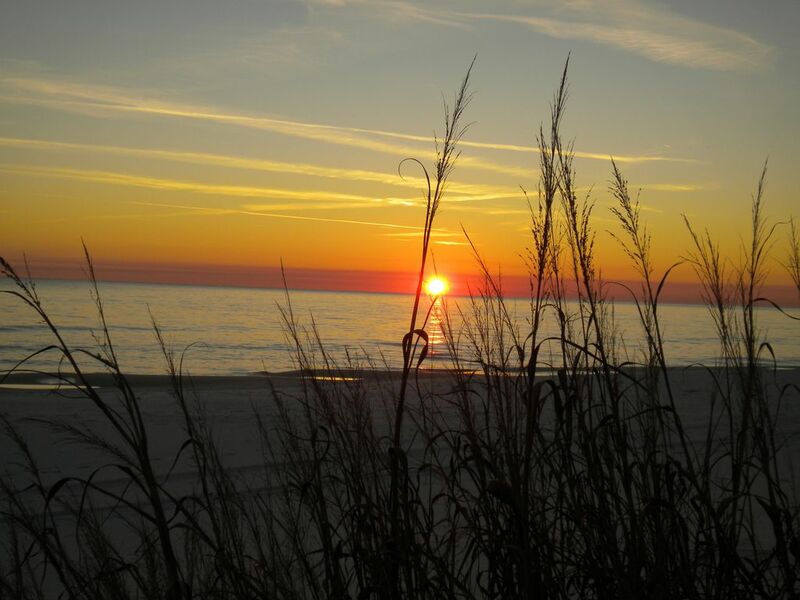 High Pointe Resort is located in SeaCrest - Rosemary beach area. One of the most convenient and popular locales, yet it is a peaceful and relaxing getaway. Unlike other Condos along this spectacular stretch of the Emerald Coast, The High Pointe Condo complex overlooks the Gulf of Mexico with an enormous 6,500 square foot lagoon pool with island water falls, hot tub, kiddie pool, kiddie playground, shuffleboard court, tennis court and a snack bar overlooking the Gulf where you can gather with your friends and enjoy a snack or have a drink while watching the beautiful sunsets. With the gigantic pool and large private beach, you won’t have to worry about feeling crowded like at other overpopulated high rise Condos. Our spacious condo is beautifully furnished in a West Indies setting and each of the three bedrooms has it's own private bathroom. There are two king beds, and two double beds. Each of the bedrooms has a 40" HDTV and BluRay player and in addition to the 65" HDTV and BluRay Player in the living room. Cordless telephone with free long distance and you’ll enjoy the luxury of having a washer and dryer as well as an iron and ironing board. The kitchen is well equipped with everything you need for any kind of cooking and plenty of dishes and silverware. For the internet fan, there is free highspeed wireless internet access. Pets are NOT allowed, No Smoking. The living room opens directly to the lagoon pool and it is a short stroll across the pool to the Gulf and is perfect for keeping an eye on kids and/or a quick, hassle-free dip in the pool or Gulf with the beach chairs, table and umbrella and two bicyclers are INCLUDED in the rental rate. There is shopping and dining right across the street from the resort and the quaint shops of Rosemary Beach are only a block away. Book it to join the sun and fun or just relax on your well deserved vacation. We are committed to making our guest accommodations pleasing and comfortable. My goal is for you to be our guest again and again! We are the original owners and since we use our place often, we have furnished and equipped it as our own home. You will find everything you need a quality furnishings that will make you feel comfortable and right at home while you are here. We hope you enjoy it as much as we do. This location was quiet, relaxed and uncrowded unlike Destin or Panama City Beach. We love the gigantic pool with island waterfalls and the direct access from our patio to the pool and beach. As Rosemary and SeaCrest Beaches grew up around us in a planned neighborhood, the locality took on a very unique and first class vacation setting. We love this place and are so happy we decided to purchase our vacation home here at High Pointe. My place is a ground floor unit with direct access to the pool and beach from the patio. Excellent location for families with children and those who do not want to lug their beach equipment down the stairs and around the building to the pool and beach. There are several restaurants across the street and one block away in Rosemary Beach all within a short walk. Of course we also have a bar & grill overlooking the gulf where you can watch the sunset or just hang out during the day enjoying the beach and sun. High Pointe is the perfect beach resort. Silestone No-Stoop Vanities. Walk-in Showers in the Front and Back King Bedrooms. Bathtub and shower in middle bathroom. Full resort including cabana beach bar and grill overlooking the Gulf, Golf practice area, Lighted Tennis Courts, Children's playground and children's pool. Activities during the summer season. High Pointe is a waterfront resort. Initial supply of paper products and soaps provided. Initial supply of detergent provided. Plenty of on-site parking. Two cars per unit allowed. Bring your beach towels for the pool and beach. A Keurig coffee maker and a Drip Coffee Maker to meet what ever your coffee desires are. Initial supply of paper goods provided. Spices and coffee filters available. Well equipped for a dining needs. Well equipped with top brand appliances and utensils. First floor patio for direct access to the pool and beach. Can rent from beach attendant. Bicycles for rent on the resort across from Building 3. Two bicycles are provided as an amenity. Large patio with table/chairs with seating for six. Can rent from the beach attendant. Golf practice area on site. Large lagoon pool with islands and waterfalls. Large Lagoon Pool with two waterfall and palm tree islands. Large Hot Tub by the pool. We have stayed at High Pointe many times and this was one of our favorite condos. Location is great and renovations are beautiful. Next time we want to stay at High Pointe, this will condo will be our first choice! Perfect spot for our family vacation! This is our third stay and it’s a family favorite for many reasons...well equipped and comfortable, a wonderful location and a great property owner! We will be back! Thank you for your review. Your family have been perfect guests and I couldn’t have any better! Great location, exceptionally convenient to the pool access gate. Second time in 6 years we have stayed in this unit and the owner, Dwight, is a pleasure to communicate with. Nicely updated decor/furniture. Will be back. Brian T.
Thank you for your gracious review Brian! We look forward to having you again. This is our first time staying in this unit but our 2nd time at High Pointe. This is most definitely our favorite and we can’t wait to stay in it again. We had 4 adults and 4 young adults. The 3 Beds and 3 Baths fit us all perfectly. Including the amazing sectional. The owner is great at responding to questions. He also has everything you can possibly need in the kitchen. The entire unit is newly updated and it’s gorgeous. Then to top it off, if you want a great location near the pool and access to the beach, the first floor walk out is perfect! We couldn’t have asked for anything better. Our fingers are crossed that when we return, we can stay in this unit again. We love this condo. It is a great location and so nice inside. Dwight's place is beautiful! The complex is in excellent condition as well. The unit was immaculate and in great order. We will come back here again soon! I also felt the need to mention that Dwight is very easy to work with and the unit is obviously kept up to date and in tip-top shape. Scenic Highway 30A Biking and walking path at front entrance of complex, Fine & Casual dining in Seacrest and Rosemary Beaches within short walking distance, Tom Fazio's Camp Creek Golf Course a short drive away. Pier Park shopping and restaurant complex is nine short miles down Hwy 98.